On the 16th January Crabtree & Evelyn launched, the new 'English Honey & Peach Blossom Collection’. This new collection prepares your skin for the winter months and conditions your skin, hydrating extremely dry and parched skin. Each product has the sweet scent of honey along with the lingering scent of peach blossom, bringing a luxurious, heavenly touch to your skin. 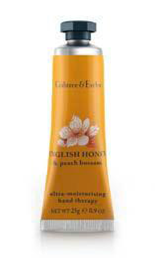 I have used a number of Hand Therapy's from Crabtree & Evelyn and the English Honey and Peach Blossom is one of my favorites and ultra-moisturising, reviving my dry skim immediately. The scent of English honey & peach blossom lingered on my hands for hours and smells delicious. You only need to use a small amount as it's thick lotion and easily smooths out around your hands, fingers and cuticles. 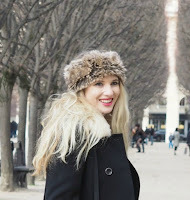 This is a definite must have during these cold winters months! Other products in the collection are a Body Butter, Body Wash, Body Lotion, All Purpose Balm and Lip Salve ranging from £4 - £22.